I'll leave it to the pundits to decide what will happen in the Republican primary now that Chris Christie has decided to keep his talents in Trenton. What does seem worth some thought, though, is what we won't see happen that we likely would have if Christie had gotten in: a full rekindling of the war over public employee unions. The issue has receded somewhat in the public consciousness since the showdowns in Wisconsin, Ohio and elsewhere earlier this year, even as the fight carries on in several states. 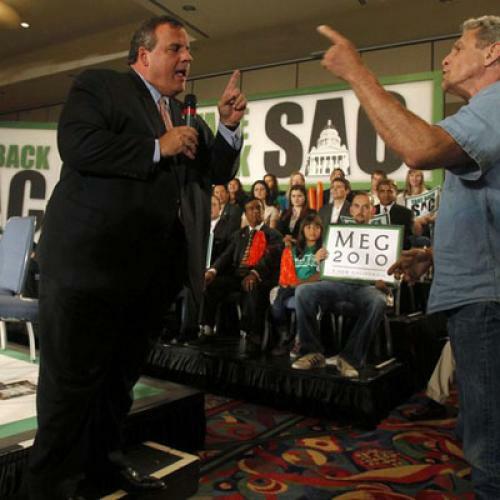 But it would have been at the center of Christie's appeal to GOP primary voters, not only because his battle against New Jersey unions would have proved his conservative bona fides, but because it was, quite simply, one of the few major undertakings of his brief tenure as governor. What is unclear is who would have benefited from the issue being resurrected. Unions are convinced that there is a broad backlash underway against anti-union overreach, as evidenced in the successful campaign to recall two state senators in Wisconsin in reaction to Gov. Scott Walker's anti-union overhaul and in the referendum campaign to repeal Gov. John Kasich's anti-union legislation in Ohio, which unions believe they have a solid chance of winning next month. From that standpoint, the entry of a presidential candidate known for dressing down teachers and other public employees would only have helped extend the energy from last winter's Madison protests to the 2012 election. "I think we see it as something of a missed opportunity," said Jeff Hauser, a spokesman for the AFL-CIO. "Christie is certainly highly vulnerable to a lot of the critiques raised about his fellow governors like Kasich and Walker and we would have contributed to he public dialogue about what Governor Christie's record really is in New Jersey -- whom he has cut or raised taxes on, and how his attack on public employees was supposed to be beneficial to lowering unemployment and getting New Jersey moving again." But that assumes that unions would be able to lump Christie in with Walker and Kasich. In reality, Christie's reforms in New Jersey did not go as far as those in Ohio and Wisconsin in that they focused on cutting employee compensation and benefits, rather than on undermining the collective bargaining and unionization process, as the reforms in the two Midwestern states did. It was the structural assault on unions that drove Wisconsin's Democratic legislators to flee the state, and that has polled far worse with voters than have reforms to simply rein in the cost of union contracts. And it was the relative restraint of Christie's reforms, in contrast to Wisconsin and Ohio's, that allowed him to get the support of a few key Democrats, including the former union ironworker who leads the state Senate. Could candidate Christie have drawn these distinctions and made the case that he delivered reform without going overboard? Maybe not. After all, even if his policies did not go as far as they could have, his anti-union rhetoric was as fiery as anyone's -- far more so than Walker or Kasich's. It was that rhetoric that endeared him to conservatives, and it would have been hard to disown on the trail, assuming he even wanted to. John Russo, co-director of the Center for Working Class Studies at Youngstown State University, said that establishment Republicans who did not jump on the Christie bandwagon may have realized that his candidacy would have riled up demoralized Democratic troops in the way that Russo is seeing happen in Ohio now, where 1.3 million people have signed the petition to repeal Kasich's bill. "I’m not sure the Republicans want to bring [the issue] up anymore, because of what’s happened in Ohio," he said. "This is what unions are mobilizing on -- this is the last stand, around the public sector. And the thing about public sector employees, unlike other industries they're in every community, and they're mobilized."